Here at 3D-Outreach, being a support and a resource to long-term missionaries is our primary focus. It is always amazing, however, to see how God consistently puts the right people across our path at the right time and with the right skills. This was the case recently, when some Pro-Christo missionaries living in the very North of Zambia requested urgent assistance in getting some quotes for a newspaper they needed to have printed. 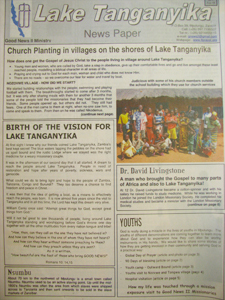 The newspaper was for a missions conference which was being held in Kabwe, Zambia, on the 1st of August, giving us just under two weeks to accomplish the task. Through complete divine intervention, we came into contact with an amazing Christian man working at a printer and he printed 1000 of these newspapers for us, free of charge! There were a number of other people who jumped in to get involved and make this project happen in such a short space of time as well. From our wonderful graphics man, Richard, who got the paper print-ready, to the printers, to the people who guillotined the papers for us, to those involved in getting the papers to the airport and finally to the missionaries who carried the newspapers to Kabwe on their flight, we couldn’t have done it without them! A big thank you to all for your kind assistance with this project. The missionaries in Zambia were beyond happy and grateful!